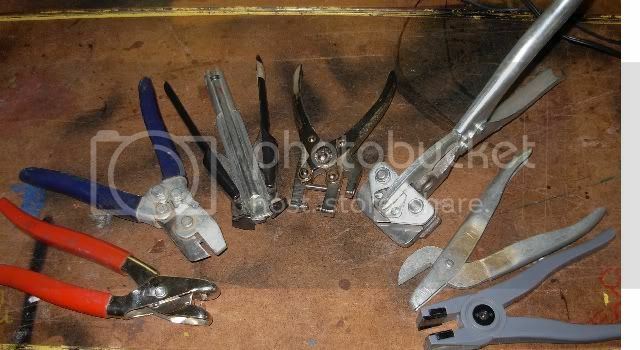 Okay,got into my "pliers drawer" ..what are they for? Left to right A-G..
Of course I didn't put in the other 1/2 dozen obvious oddball ones.. Sorry, I can only do ONE mystery tool at a time! If you can only do one..do the other mystery tool thread..added a new tool there..another simple one..
A) Looks like something from a disputed election. A hanging chad punch I think. If you are talking about the other item in the other thread...nope.It's a well used tool..especially in my past construction work...In a day or two(if no one has guessed,I'll add a related simple tool..
Atta boy!! !Okay..now what about the rest? D) Pliers for installing snaps or grommets? E) Maybe for folding corners in metal strips? 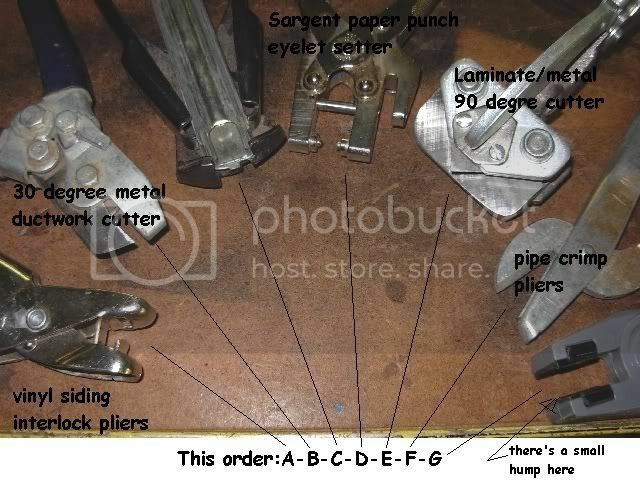 B is a notching tool i use almost dayly. it's used to make a "dovetail" joint when cutting into the side of ductwork. D looks to be anb eyeletting tool. E is another sheet metal tool that i happen to have. it notches out a 90* inside corner.used to make angle frames' corners. I figured you'd have some,Daren..the 90 degree tool we used a lot for the older laminate metal trim for backsplashes,cutting everything but the bottom bead...that way you always get a perfect 90 degree for the corners and the bead bends.Gee..I wonder how many people here have that old metal trim around their kitchen counter backsplashes or shower laminate tub enclosures..raise your hands..who's guilty?! The other one Daren guessed is a punch(Sargent) that also sets eyelets in paper or plastic sheeting..could work for thin metal I guess.The depth from the edge can be set with a gauge so they all line up..Think stoves and windscreens..Hmm..now what could you do with that?Lace-able windscreens connections?Joining windscreens together with screws through eyelets?..or joining pieces with just the eyelets!....I see options!